Masala puri is one of the most popular chaat/snacks in most parts of the India. This can be easily prepared at home and make it healthier by using baked puris. It can be served as an appetizer. Cook yellow mung beans and peas in a pressure cooker with enough for 3-4 whistles. Allow the steam to escape before opening the lid. As the steam escapes open the lid, mash peas, dal using mashed and set aside. Combine the ingredients mentioned under grinding table in a processer/ blender and blend it to fine paste and set aside. Heat oil in the non-stick pan adds ground paste and cook on low flame for 8-10 minutes. Then add mashed peas-mung dal , finely chopped dates, salt and give it a stir. Simmer and allow it to boil and thicken to the desired consistency. The gravy should not be too thick or too thin. Turn off the flame and start serving. In servings plate take 5-6 puris in each plate and crush them, add peas masala. Add onions, tomato and sev as topping. 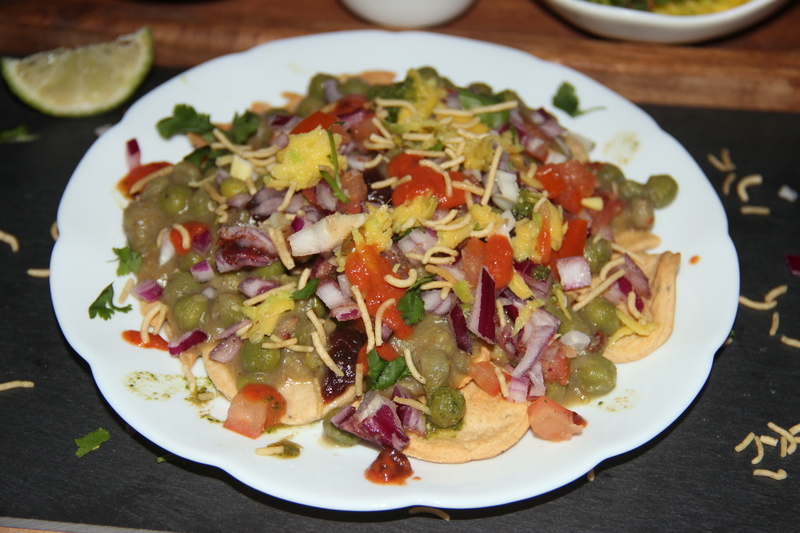 Posted on August 24, 2014, in Indian, Starters and tagged Chitras healthy kitchen, drchdietfood, Healthy indian masala chaat. Bookmark the permalink. 30 Comments. Tell me something! Do you make all these things DAILY? I mean, uou blog sometimes three times a day which, iI assume, means you MAKE these three ‘blogable’ dishes every day!! Don’t you ever make something ordinary like us mortals? Oh yes..one of my favourites too..
It’s my families favourite as well ji so tried guilt free version….thanx a bunch…. What a yummy looking plate!